Team up with colleagues and walk your way to wellness this year with our Step Up Challenge – part of our new series of competitions for 2016. We all know that being active is good for us but sometimes taking that first step can be tricky. So we’ve made it easy for you to get moving in 2016 with the Step Up Challenge. 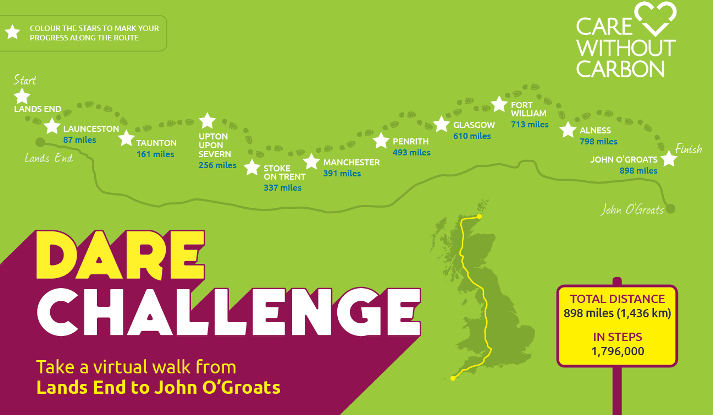 We’re challenging staff from Sussex Community NHS Trust and Brighton & Hove primary care to team up with colleagues and walk as far as they can over 12 week period. We’ve identified 3 virtual routes for you to choose from depending on your team size, from the South Downs Way (and back again) to the more challenging UK coast – all from the comfort of where you live and work! Join the 12-week Step Up Challenge to get fitter, use less carbon and cut costs on car travel. On the flat, or up the stairs, every step will count. The Step Up Challenge begins on 15 February. First you’ll need to get your team together (or choose to go it alone). Teams of up to 8 people can take part depending on your chosen route. We have produced a handy Challenge Toolkit to help you on your way which explains how to get involved and includes charts to help you track your progress. There will be a prize for the team with the most steps per person, and a prize draw for all teams completing their route. With 12 weeks to complete your walk and 3 routes to choose from the Step Up Challenge is great for anyone, whether you elect to go it alone or come together as a team. For each route, there are 10 milestones along the way to help keep you motivated. A4 poster for you to put up in your office to promote the challenge and get your colleagues involved. Tools for how to count your steps. Sussex Community NHS Trust staff click here. Brighton and Hove CCG and GP Practices click here. We ask you to send us a monthly update so we can compile a progress report and you can see which team is in the lead. Then at the end of the 12 weeks take a photo of your challenge chart and send it in to be in with a chance of winning. There is everything to walk for!